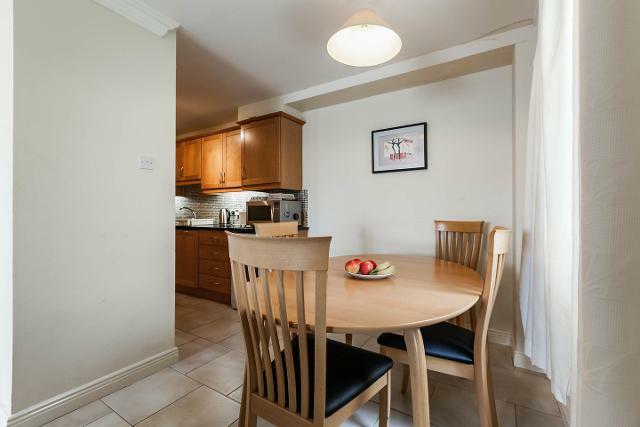 The apartment is located within 10 minutes drive of one of the largest shopping centers in Europe,Dundrum Town Centre. With it’s fashionable outlets such as Brown Thomas, House of Frazer, Marks & Spencers, brand new cinema and fine restaurants it has plenty to offer guests in terms of retail shopping and entertainment. Restaurants include Mao and Milano. The apartment has 2 comfortable bedrooms one of which is ensuite. There is a large comfortable sitting room with dining area. The modern kitchen is fitted with all the conveniences expected including washing machine/dryer and dishwasher. You are located close to Leopardstown Racecourse where regular race meetings are held. There are a number of health clubs in the area with swimming pools. There are some great beaches within a one hour drive. In Dublin City there are many tourist attractions including Guinness Hop Stores, The National Art Gallery and several museums.There are several City Bus Tours to choose from. The apartments are 15 minutes drive from Johnny Foxes pub the highest pub in Ireland. There is nightly entertainment here with the emphasis on traditional Irish music and dance. The restaurant serves excellent food with seafood being the speciality.